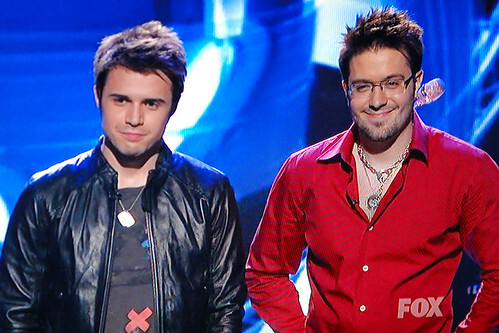 I confess - I watch Idol and I want Kris or Danny to win. I hope you don't think less of me. I'm *really* just a casual watcher. Because I have violin lessons on Tuesday evenings, I never get to watch an entire episode. Yes, I could DVR the thing and watch it later, skipping through the 70% fluff and commercial content, but there is something about watching all of that stuff as it happens. Sometimes you have a train wreck, other times you have pure genius (at least my definition of genius). So, my confessions from the current season. I do not like Adam the screecher. I don't like his look, his demeanor, his drama. Yes, he can sing. I don't want to listen or watch it. I didn't care for Kris until the week he sang "Ain't No Sunshine". I love that song to begin with, and his version was genius. I even paid for it on iTunes. Anyone who knows me knows I NEVER buy anything on iTunes. So I hope Kris continues on. Or at least records something. I like Danny more each week. He can sing. He can perform. Maybe I will buy his album. Allison is fine - she can definitely sing, but at this point, she's kind of a garnish on the plate. So there. My opinions. I'll go back to secretly watching and you won't have to hear any more of my opinions for the rest of this season.